​Lets let Jeff Flake know what we think of him, please get involved! If the link above did not work please copy and paste contents below. You are not running for office, but totally derailed the confirmation of Brett Kavanaugh because a bunch of Soros funded women yelled at you in an elevator. While we cannot express our anger at you at the ballot box because you are not running for office, we can express it here. One of the women who attacked you in the elevator is Maria Gallagher. She is the co-executive director for the Center for Popular Democracy and the Center for Popular Democracy Action fund which is heavily funded by George Soros. In addition, it supports movements like the Black Lives Matter Movement, BDS, otherwise known as The Boycott, Divestment, Sanctions movement (this movement works to end international support for support of what they call, Israel’s oppression of Palestinians) and the Antifa Movement. You allowed them to undermine the whole confirmation process. Shame, shame on you. Now you got what you wanted, an FBI investigation, which will probably have no effect in the end. Do you really think it will sway one Democratic vote? They decided long ago that they were not going to vote for Brett Kavanaugh. 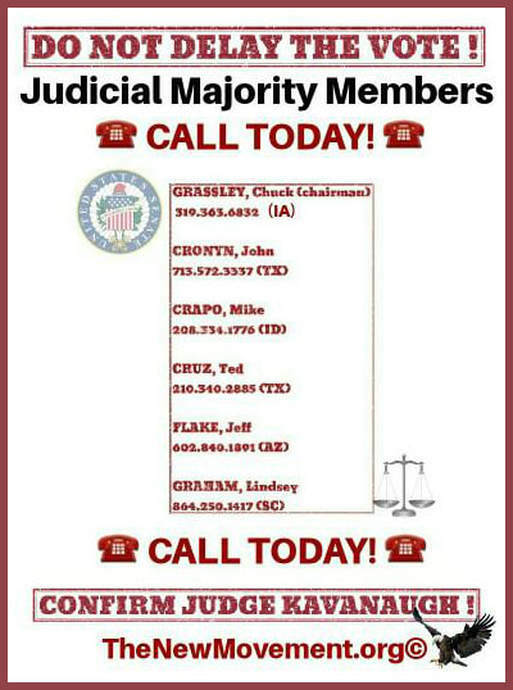 They are willing to destroy the exemplary career of a fine justice in order to control the Supreme Court. Voters are outraged, furious, incensed and enraged at this attack on one of the best nominations to come before the Senate and to be confirmed to the Supreme Court. And you fell right into the trap of the Democrats. Think about this, if they are able to destroy a man’s career and life to control the Supreme Court, what the hell are they doing to control our nation? You said you would vote to confirm if the FBI investigation was completed. It is and it will be. Keep your promise. Do the right thing. Vote to confirm Brett Kavanaugh so we, as a nation, can move on. 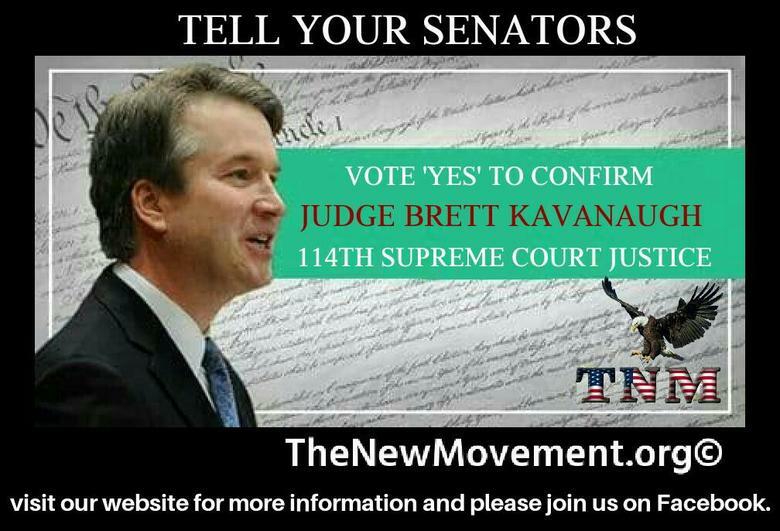 This is a last-minute push to help Brett Kavanaugh out. We all know this whole Blasey Ford thing is a political ploy to delay the confirmation until it is too late. She has her chance to appear before the Senate and had changed the date more than once. Also, she and her attorneys keep changing the rules about testifying, once again to delay the vote. Enough is enough already. Please call and tweet. Use the new tweets, the old tweets, whatever, but please keep the pressure up. All the while providing NO relevant information or facts. I CAN TELL YOU WHEN, WHERE, HOW, TIME OF DAY, WHAT I WAS WEARING, WHAT HE WAS WEARING, WHAT HAND GROPED ME FIRST, WHAT HE SMELLED LIKE, HIS BREATH AGAINST ME, HIS BODY HOLDING ME DOWN, THE SNIDE HILLBILLY MOCKING AND LAUGH OF BILL CLINTON....this will forever be etched in my memory- always. Don’t you dare belittle me or other victims of sexual assault Christine Blasey-Ford. Shame on you! ​Tweets below!! Take your time and don't get thrown in Twitter Jail, These are new tweets that are very important to send! There are 50 Tweets below tagging everyone in the Senate and they will hear Leslie Millwee's testimony please share! Also do only 10 at a time so your account does not get temporarily locked out! [email protected] The GOP caved and you got your investigation. 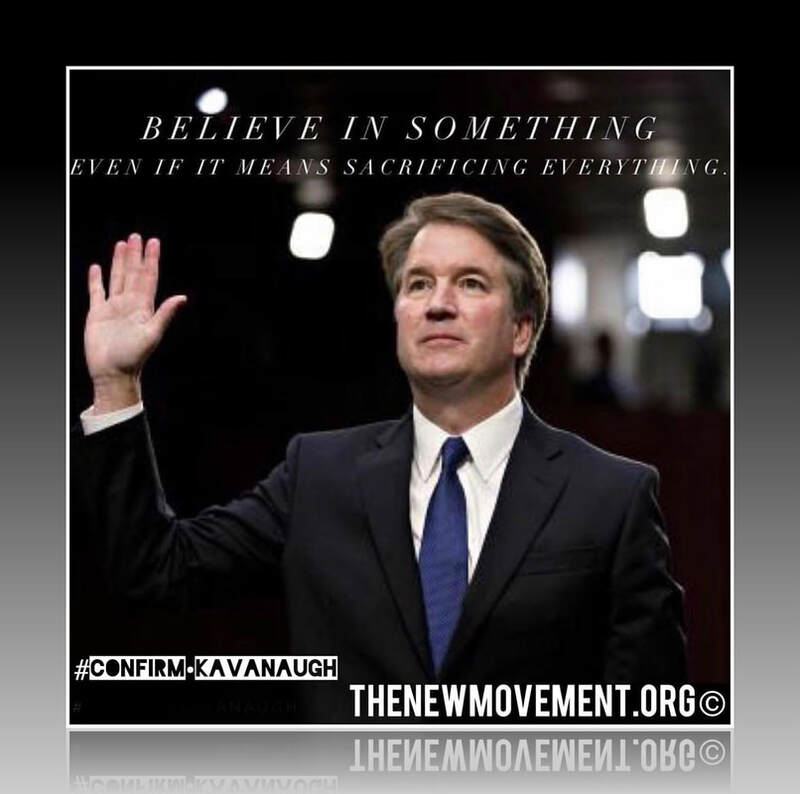 Now follow through and vote to #ConfirmKavanaughNow. This has been a despicable political sham forced on the people of America. [email protected] You call your decision to give in to this liberal plant's demands INDECISIVE? I call it idiotic and complete disregard for every American. 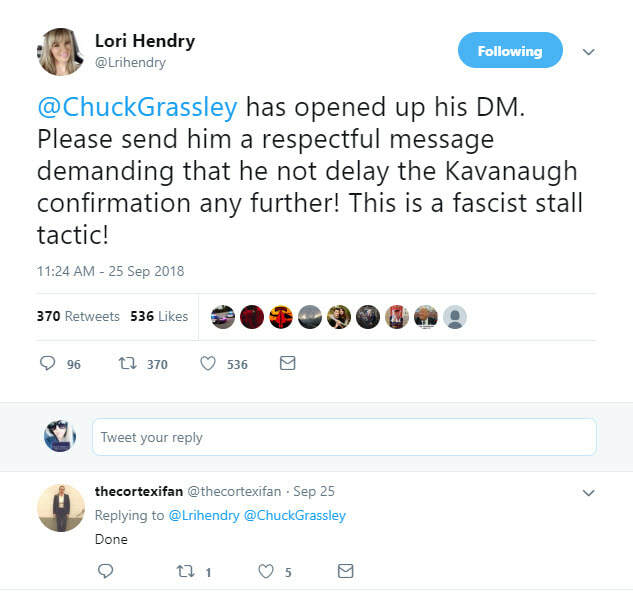 These liberal resist and disrupt tactics YOU are allowing Senator!